Costa Rica--Where Esri T-shirts Rule! 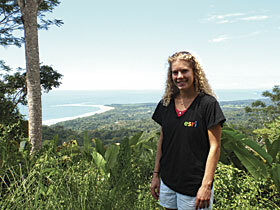 Costa Rica—Where Esri T-shirts Rule! Amy Work, Geoporter director, shows off her Esri T-shirt high above the tombolo (sandbar) in Parque Nacional Marino Ballena in Bahia Ballena-Uvita, Costa Rica. Bahia Ballena-Uvita is home to Geoporter, a volunteer-based program that educates and trains teachers in local schools, tour guides, and community residents on how to use GIS to identify and map resources they think are important to their community. This is the first community project for Geoporter.